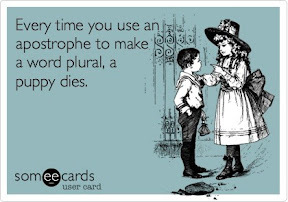 I am one of those people who is a freak (and probably a pain) about good grammar. Sure, I make allowances for auto-correct or (in a casual or personal setting) mindless errors made by quick action and/or lack of proofreading. Heck, I'm not perfect; I realize (sometimes too late) that I make grammatical mistakes that I shouldn't have because I know better. Heck, in some situations, I even use bad grammar on purpose. Those are not the things that bother me. What bothers me are the mistakes that people make because they just don't know any better—and worse, sometimes because they just don't care. That's unforgivable. It makes me fearful of the educational system (both public and private), and it makes me weep for future generations, who are certainly on the road to proving that Mike Judge's Idiocracy may be less fiction and more of a prediction (a sad, sad prediction). What are some of the things that really grind my gears? using an apostrophe to make a word plural. "Hey mom's! I need some help!" is not correct. With some exceptions, "'s" is used to denote possession, not number. Stop using it. Seriously. I got an e-mail yesterday that said "Get Dad's What They Really Want." I will never purchase from that company again. not knowing the difference between "there," "their," and "they're"; "it's" and "its"; "here" and "hear"; "your" and "you're"; "four," "for," and "fore"; "specifically" and "pacifically"; "ask" and "axe".... Well, you get the picture. 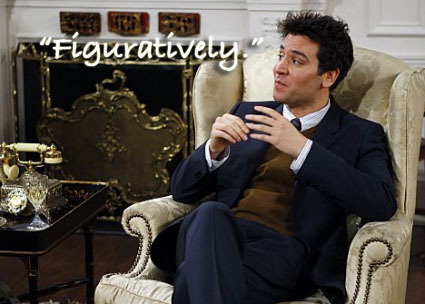 "irregardless" used in a non-ironic way. It's not a word. Stop trying to make it happen. It doesn't make you sound smarter. "alot" and "allot" — They are not the same as "a lot." Really, they aren't. One of them isn't even a real word. "ya'll" — Okay, I know I shouldn't be peeved about the misspelling of a slang word, but it bugs me. Why? Because it shows a lack of understanding of either the purpose of the word or how contractions work. "Y'all" is short for "you all"; thus, the apostrophe goes after the "y" as a replacement for the "ou" that is gone. TXT-speak on anything other than text messages, twitter, or some other extremely informal and character-limited form of communication. If you send me an e-mail or letter that includes such gems as "Wat r u going 2 do 2day?" don't get mad if I don't respond. My lack of response is probably a lot more polite than the answer you would get back. I recently started a job where I'm doing much more (almost exclusively) transactional type legal work than litigation. Switching practices like this has brought our my inner grammar geek in full force. You would think that my former practice (a litigation hybrid), involving a lot of memos and court pleadings, would have given me more encounters with bad grammar than my current gig (transactional work, for those of you that didn't click the link, consists of non-litigation things like drafting contracts); but it didn't. Don't get me wrong, there was plenty of bad writing to be seen in my days as a litigator. However, most attorneys who are drawn toward litigation tend to be good writers [I'm not talking about those general practice lawyers who do anything and everything; I'm talking about people who are strictly in litigation or litigation-hybrid practices of law]. Also, those who aren't good writers usually (but not always) tend to acknowledge their weaknesses in that area and leave the heavy drafting to the good writers. I suspect that I'm seeing so much bad writing in a transactional setting [not, mind you, coming from any of the lawyers at my current job, who are all as grammar geeky as I am], because when people start drafting things from a form, they get really lazy. And if they're already inclined to be lazy or just don't know any better, they don't know when the things they are copying are wrong, and they also don't know how to make their new additions to those forms look right. Today, I received a draft [not from anyone at my company!!] that had the word (rather, "word") "interfear." Seriously. If you don't know what's wrong with that word, we're already starting at a deficit here. Honestly, I don't even know how someone could have given me a draft with the word "interfear," because the red swiggly line was clearly under that puppy. I mean, the only thing I could imagine other than pure laziness causing the person not to notice, is that s/he [not saying which] has written that word so many times, that s/he finally added it to his/her custom Word dictionary. If that's the case, that's just sad. Because if that happened to me, I would be inclined to do some Google research to see why Word hated my word so much. Seeing this patently wrong "word," however, reminded me of an e-mail forward I got a long time ago about The Washington Post's Style Invitational. In one of the contests, they asked readers to take any word from the dictionary; alter it by adding, subtracting, or changing one letter; and supply a new definition. The contest generated such awesome words and definitions as (my personal favorite) "sarchasm" (n.): The gulf between the author of sarcastic wit and the person who doesn't get it. I shared my made-up definitions with the co-workers who had commiserated with me this morning over the awful grammar in the document I was reviewing. We all decided to make this a "thing." The next time we get some godawful, "they really should have known better" spelling mistake, we're just going to make a new word out of it. Of course, this doesn't help at ALL with the everyday grammar mistakes that don't involve gross misspellings, but at least it's a start. And if you have any idea how to put a silver lining on those monstrosities, please let me know.